Mike grew up outside of Boston, MA and moved to Charleston in 1985. He is the co-founder of Masters Studios of Self Defense along with his partner Philip Beauregard. 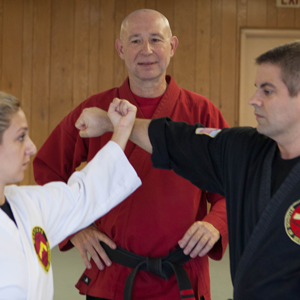 Mike has been training and teaching for over 25 years and is a 7th degree black belt in Kempo Karate. He continues his Kempo training under 8th degree Black Belt Master Bob Nohelty from Boston, MA. Mike has visited China three times and has been to the Shaolin Temple. He has worked out at the famous Temple and learned a Broad Sword form and a Straight Sword form from the Shaolin Monks. Mike continues his Kung Fu and weapon training under his friend and teacher Sifu Yao Li of Boston, MA. 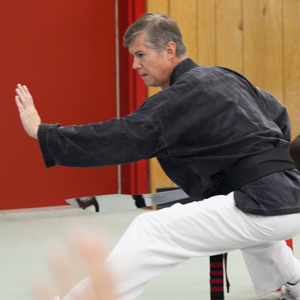 Mike also studies and teaches Tai Chi Chuan, Tai Chi Jian and Tui Shuo (Push Hands). With the help of his Tai Chi instructor Joshua Grant, he has built a large Tai Chi program. Mike is the Director of Masters Studios of Self Defense in Mt. Pleasant. Wendy Burkhardt has lived in the Charleston area since 1987. A life long athlete, she became a certified personal trainer in 1992. Martial Arts became a part of her own training in 1994. She is currently a Forth degree Black Belt in Kempo Karate. She also trains in Chinese Kung Fu, Weapon forms, and Tai Chi Chuan. 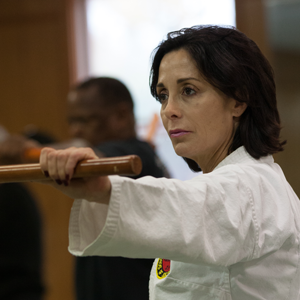 Wendy’s teaching duties at Masters Studios include the Conditioning and Sparring Class, Beginner and Advanced Tai Chi classes, and karate and Kung Fu classes among others. Her background in fitness adds a unique perspective to the classes. Paul’s martial arts training began with Judo, at age 5. He continued his judo training through college, as a member of the USC Judo Team. He has had the opportunity to study several other martial arts, including Jee Do Kwan Tae Kwon Do, Kempo and two styles of Combat Kung Fu: Lung Tao Chuan and San Soo. He has been teaching various styles of martial arts since 1982. 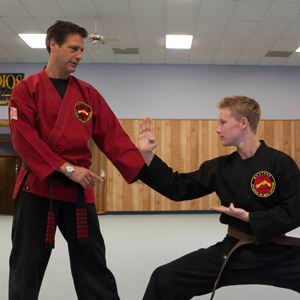 Paul began his Kempo training under Master Mike St. Amand in 1997 and teaching with him since 2001. He has also been studying and teaching Tai Chi Chuan and Kung Fu under Master Mike and Joshua Grant (both Yang and Chen Styles) and Kung Fu under Sifu Yao Lee since 2001. Wally is originally from New York and first started training in the Martial Arts in his home state. Upon arriving in Charleston, he continued his training. He has been teaching and training for over eleven years with Masters Studios. He is a fifth degree Black Belt and Chief Instructor at the Mt. Pleasant Studio. Beside Kempo Karate, he is certified to teach Chinese Kung Fu (Nan Chuan, Chang Chuan) and Weapons. He is also certified to teach Tai Chi Chuan and Tai Chi Jian. Wally is in charge of organizing the day to day teaching of all the classes. When Wally is not teaching, he enjoys working out and practicing the three section staff, which is his favorite weapon. Bobby Smith is a fourth degree Black Belt and is originally from North Carolina, but has lived in the Charleston Area most of his life. In addition to Kempo Karate he also studies and teaches Tai Chi Chuan and Kung Fu. Bobby’s other activities have included at various points animal studies, racquetball, snow and water skiing, painting, playing the guitar, inline skating, writing, rock climbing, and computer software development.